Honey is often perceived as a healthier sweetener alternative because it is more natural -- like agave syrup, black strap molasses and maple syrup. However, whether you eat refined table sugar or honey, your body reacts the same way. Sugar is sugar. If you have diabetes, or try to keep your blood sugar levels under control, you can include small amounts of honey in your diet, but you need to first understand how it can influence your blood sugar levels and what serving size is appropriate. The taste and nutritional value of honey may vary slightly, depending on the type of flowers used by the bee to produce honey. On average, 1 teaspoon of honey contains about 21 calories and 5.8 grams of carbohydrates. Carbohydrates comprise starch, sugar and fiber, but in the case of honey, all carbohydrates are in the form of sugar. Honey actually contains more sugar and carbohydrates per serving compared to regular table sugar, which has 16 calories and 4.2 grams of carbs per teaspoon. All carbohydrates, with the exception of fiber, can raise your blood sugar levels, whether they come from honey, bread, rice, potatoes, candies, fruits or table sugar. If you have a blood glucose meter, you can do an experiment. Take a specific amount of carbohydrates and monitor your blood sugars at determined intervals after eating and you will see that the carbohydrates you eat are converted to sugar and once absorbed into your bloodstream, carbohydrate-containing foods elevate your blood sugar levels. If you do not have diabetes, your body will quickly release insulin to prevent your blood sugar levels from rising too high, but if you have diabetes, your blood sugar levels can easily go beyond the upper limit of the desirable range for your blood sugar levels. The glycemic index, or GI, is a useful tool to estimate how quickly carbohydrates are converted to sugar and absorbed into your bloodstream. The GI ranges between 0 and 100 and the higher the GI value, the sharper the rise in your blood sugar levels. Honey has a low to medium GI value, varying between 35 and 58, depending on the type of honey. As a basis for comparison, the GI of table sugar has a medium GI value of 60, white bread has a GI of 70 and pure glucose, or dextrose, has a GI of 100. Honey is therefore associated with a slower and smaller increase in your blood sugar levels compared with table sugar, white bread and pure glucose. 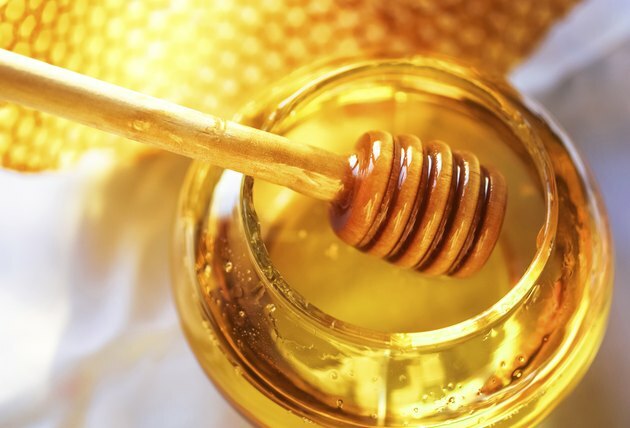 Like any other sweetener, honey should be used sparingly in your diet. Although honey has a relatively low GI value, eating a large amount of honey can significantly raise your blood sugar levels and make them exceed the desirable range. For example, try using about 1/2 teaspoon of honey to mildly sweeten your tea, plain yogurt, bowl of steel-cut oats or smoothie. If you use honey for baking, try using half or even a third of the amount required in the recipe to lower your carbohydrate and sugar intake and keep your blood sugar levels more stable.